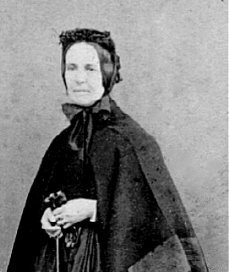 Stowe Margaret, known as Margaret, was born at Stowe, Buckinghamshire, on 7th August 1811. Hugh Selwyn Gaskell writes that Mrs Hugo was left very badly off (presumably after 1877, on William’s death) and set about providing for herself and her family by starting a small school in which she and one or two of her daughters taught. Margaret would have been 65 in 1877 and it seems unlikely that she would have started a school at that time or needed to provide for her family. An alternative possibility is that she was separated from her husband, although unlikely. According to the Census of 1881, Margaret, aged 69, was living with her daughter, Emily Jane Hugo, aged 31, at 14 Montpellier Villas, Cheltenham. Margaret's daughter, Laura Temple Hugo was lodging at the next door property - 16 Montpellier Villas - the home of Mr & Mrs Joynes. The only other comment of Hugh Selwyn Gaskell is that Margaret was forever mending, washing and generally looking after her daughters’ clothes, especially their white cotton stockings which required a lot of attention. According to the 1891 Census, Margaret was living with her daughters, Laura, Margaret and Emily at 5 Ashley Terrace, Ilfracombe, Devon. Margaret was of Independent Means. Margaret died at 93 Iffley Road, Oxford in 1900 and Probate was granted to her brother Frederick Temple. Her effects were valued at £1,068.7.7d, resworn May 1901 at £1,468.7.7. Her will records bequests to a grand daughter, Margaret Horatia Hugo and grandson, Wilfred Hugo, children of her son William Temple Hugo. Also mentioned are her daughters, Laura, Emily Jane, Isabella Catherine Blake, Margaret and Horatia Octavia.